10 minutes is all it takes for this tender and flavorful garlic and parm Instant Pot asparagus! This side dish is perfect for the holidays, summer entertaining or a regular weekday side dish. 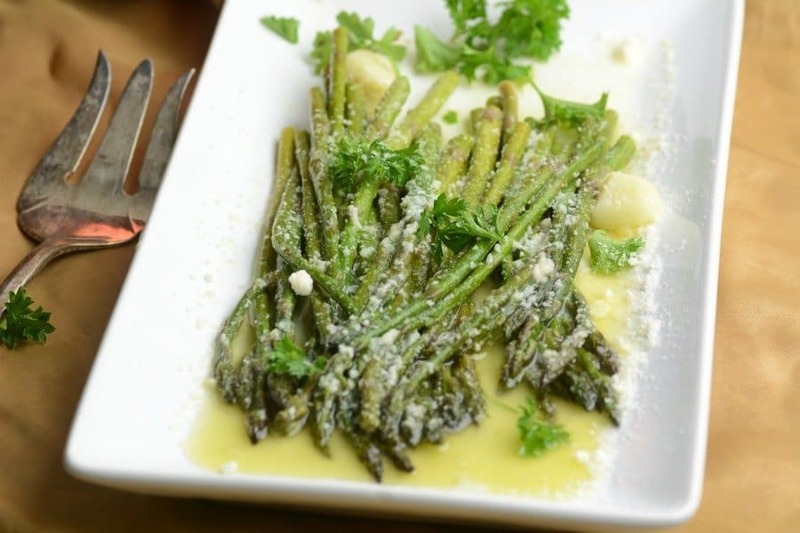 If you are a fan of asparagus you will drool over the incredible flavor of garlic and parmesan next to the asparagus. Don’t want a bland vegetable side dish? Me neither! That is why this asparagus is on constant rotation in our home. When I can find a good sale on asparagus or it is in season and I can buy some at the farmers market, we eat this a ton. The Instant Pot does a great job of bringing out the natural sweetness of asparagus. 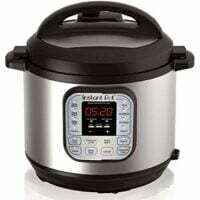 While I love a roasted vegetable, I have to say the Instant Pot is moving right up into competition. I can’t even begin to tell you how fast and easy this recipe is for such flavorful asparagus! When garlic and parmesan come together I have to say it is always a winning dish. There are so many reasons why I love this side, those are just a few of my top reasons! Yes, you want to make sure to wash your asparagus spears under cold water to get rid of any dirt or grit that is on the asparagus. Make sure to wash it really well as some grit can stick to the spears. After you wash your asparagus, you want to snap off the bottoms of your spears. Aim for around one inch from the bottom, you will find the asparagus will naturally break on the woody portion of your spear. Repeat till all your spears are prepped. Then dry them on a towel or paper towels. This green vegetable is loaded with nutrients that are beneficial to your body! 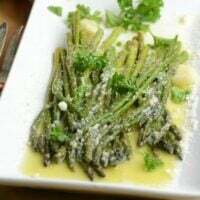 I always recommend whipping up asparagus when you can for sides, tossed in soups, main dishes, and more. Look for the bright color of green on asparagus when picking it out. You want to have a stiff stock that will hold its shape. If it begins to limp that is signs it is bad. The tips of asparagus are the first thing that starts to go bad. When they become mushy or black you know it is time to toss it out. Another thing to look for is limp or slimy stalks. Any of these signs mean to toss your asparagus out. Talk about one incredible vegetable, am I right? Plus the versatility of this veggie sure can’t be beaten. Give this side dish a try tonight. It offers an elegant aspect that will leave your guests happy and bellies nice and full. The Instant Pot makes asparagus so easy to prepare and serve any day of the week. 10 minutes is all it takes for this tender and flavorful garlic and parm Instant Pot asparagus! Place 1 cup of water and trivet in the bottom of your Instant Pot. 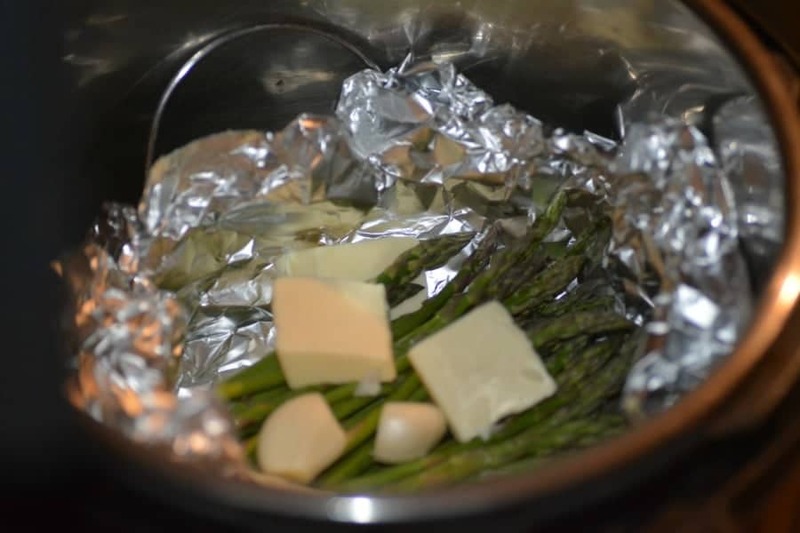 Place Asparagus on a large piece of aluminum foil with whole cloves of garlic and butter. Curve the edges of the aluminum foil so no butter leaks out. Place your Pot on High pressure for 8 minutes. I like my asparagus soft if you like it crispy only do 4 minutes. Do a quick release Sprinkle with Parm cheese and serve. OMG! This asparagus is awesome! Thanks for sharing. So good and easy to make! I set the pressure cooker for 6 min and it was the way we like it! Turned out PERFECT!!! I loved it without the Parmesan cheese but the kids liked it with the Parmesan added. I’m looking forward to making this again. THANKS!